Dulverton films was launched in the summer of 2010 with a screening of the British film success "An Education" to a full house. Quite a lot has changed since then, there is now seating for 120, a 16 x 8 foot screen and films are shown using an NEC HD digital projector with full surround sound. A licensed bar is open before the film and during the interval. Each year Dulverton Films presents a season of selected contemporary, foreign language, documentary, classic, British and International releases from the UK and around the world with monthly screenings from September to August. The programme of films for screening is selected every two months so that they can be shown soon after their release. You do not have to be a member of Dulverton Films to come to our performances, indeed we encourage everyone to attend (subject to film classification), but members benefit from a discount on ticket prices. There is access for wheelchairs and a lift is available to the upper floor. 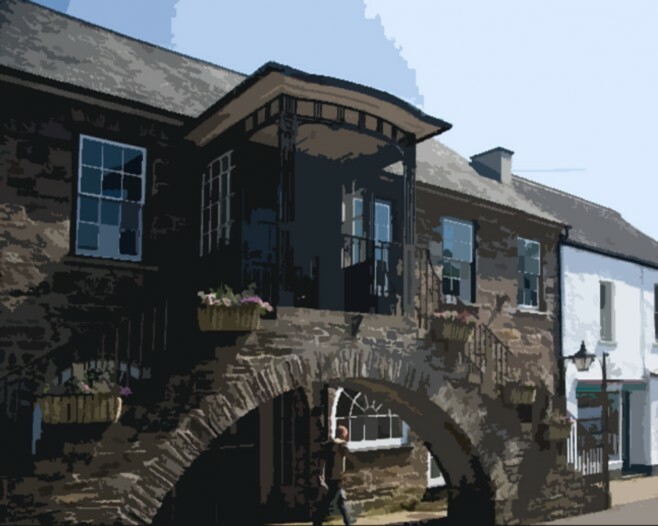 Dulverton’s lovely medieval Town Hall is an ideal venue for a film society, it's large upper room which has a stage and a bar area can seat more than 100 people comfortably. The building itself had a feature part as the dance hall in David Leland's 1988 hit film "The Land Girls". In the 1940's the Town Hall became "The Dulverton Cinema" providing twice weekly shows so successfully that the owners wanted to build a permanent projection box. The Ministry of Works at the time wouldn’t give permission to build this addition unless it was of national importance as materials were in short supply. However when 6,000 American troops arrived, camping out on Winsford Hill, Dulverton Cinema's film shows were at full capacity and a new application for permission to install a projection box was granted. With the help of a small army of Americans, Fishers Building Contractors installed a steel girder across the rear of the hall and the raised projection box was built by an American Master Sergeant and Mr Fred Puttock, a carpenter at Fisher’s. The box was finally completed in 1944 just before the troops left the area for the D-Day landings. The film shows lapsed after the war and despite its cinematic history Dulverton Town Hall had not used its facilities for regular film showings for more than half a century, apart from a brief spell in the 1970s when it was used by a film society. In 2010, Town Hall Committee members Jan Ross and Christine Dubery teamed up with Victoria Thomas of the Regal Film Society in Minehead to launch "Dulverton Films". A large retractable screen was incorporated into the stage and an early digital projector installed in the original projection box fed by a then state of the art Blu-Ray player. The Town Hall Committee is very grateful for all the financial support which made the 2010 project possible. A grant was donated by the Somerset Community Foundations’ Grassroots Fund, and Dulverton Development Forum. Dulverton Players also contributed to the total cost of the new equipment. Dulverton Films continues as a very successful enterprise and upgraded its film presentation facilities in 2016 with a brand new HD digital projector given as a generous grant by the British Film Institute. To match this excellent new projector the committee approved the necessary expenditure to install a high fidelity sound system with eight new loudspeakers fed by the latest technology in amplification. Everyone who comes to see films at Dulverton Town Hall can feel that they are part of history.